We live in a age of top-knotch security. We triple check we lock the door before our head hits the pillow. We spend large chunks of money yearly for security systems to alert us to intruders. We can't even get into our emails without the proper password that is 12.5 letters, half lowercase, half sideways, and a number or 2 to make it really unique. Let's face it-we've put a high priority on keeping ourselves, our loved ones, our belongings-and yes even our spam mailbox-safe and secure. And rightfully so. But the truth is, I've been stolen from by a recurring thief more times than I'd care to admit. Want to hear what's more embarrassing than not wising up to a thief's scheme and allowing him to do it again and again?? Practically handing it over to him. Again, and again, and again. Unfortunately this thief has never stolen anything I could replace, like material possessions. No he went for the big stuff. The life stuff. He has stolen moments, time, opportunities, life. Sometimes he has used people's sins to steal from me. But instead of praying through that hurt and forgiving and releasing it, I have clung on to it and allowed the thief to not just rob me once, but keep on robbing me for years. Recently I imagined if someone broke into my home and stole some of my most precious family heirlooms that were irreplaceable. 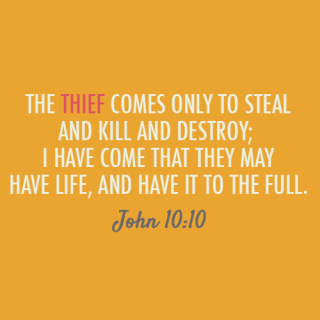 But instead of trying to do something about it, I hand over even more things for him to steal as if to say-you forgot this…and this irreplaceable precious item too…That is how I have handled satan's schemes from time to time. That is what God is convicting me over. What if God is looking at that thing we were robbed of-even if it was our fault for leaving it out for the taking-and getting down on our level to just sit and weep with us. What if God is watching the thief steal more and more from us and begging us-dear child I had more in store for you don't give that to him too! Give it to me so I can keep it safe! What if God is quietly approaching us with an offer on the table of this: keep on doing what you're doing, allow satan to keep robbing from you, or turn from that and run into my arms and embrace the life that is truly LIFE. Quit being robbed from all that I have in store for you sweet one. What if the first robbing from satan and that huge awful experience you went through didn't have to be a life sentence. What if there really was a plan b, and it was good. Really, really good. You know the kind-the full and abundant kind. Visiting from the MMB! Really good post. Thanks so much for stopping by Erika!